For two weekends in a row, I’ve made a different delicious dip, so I’m sharing both in one post. My first dip, the Avocado Feta dip, was inspired by two recipes I’d pinned recently – this Creamy Avocado Yogurt Dip and this Greek Feta Yogurt Dip. 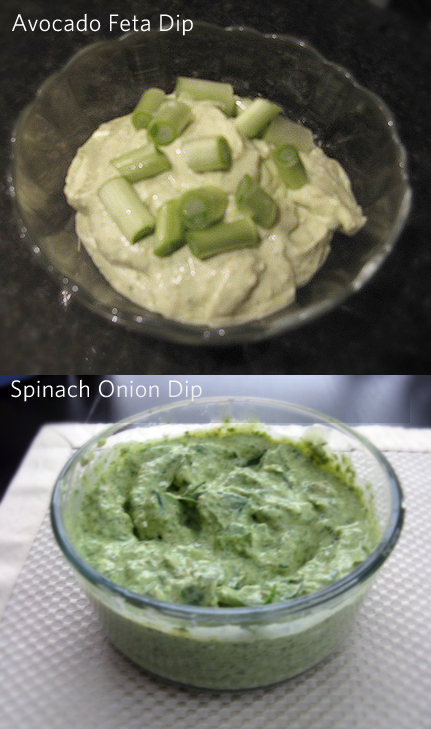 My second one, the Spinach Onion Dip, was inspired by this Fresh Spinach Dip recipe. The only prep work here is washing the cilantro, getting the 2 cloves of garlic out, and getting the avocado “meat” out. Since it’s all going into a food processor, none of it has to be done neatly. I also threw in a few pieces of caramelized onion that I’d made for another recipe. For the cloves of garlic- the easy way to peel garlic is to smash it! It’s kind of fun, as long as you don’t hit your fingers. 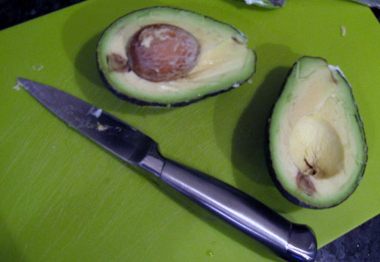 For the avocados – I cut along the avocado the long way, all the way around, cutting down to the pit. Then just open, and voila! Scoop out the good stuff, throw away the brown bits and the seed. Put it all into the food processor, and yum! If you want to be fancy, save a bit of cilantro for garnish. I forgot this step, hence using green onions as garnish. I used crackers to dip in this, though I’m sure it would be good with veggies as well. Optional, I just had made some the night before and couldn’t figure out what to do with it. 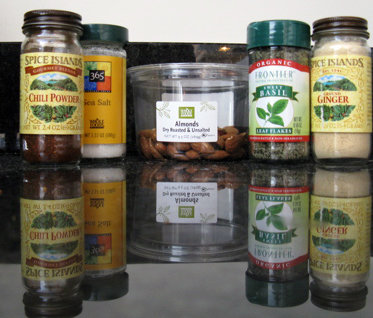 You could have raw garlic or garlic powder instead. 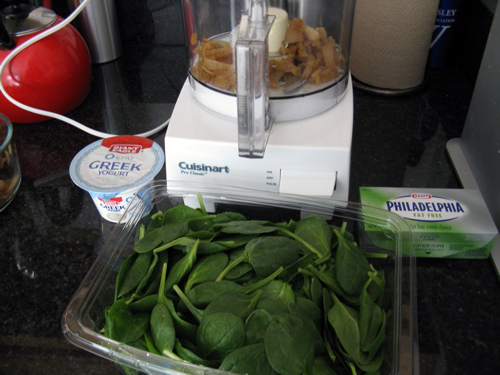 Combine all ingredients in food processor, reserving an ounce of spinach. 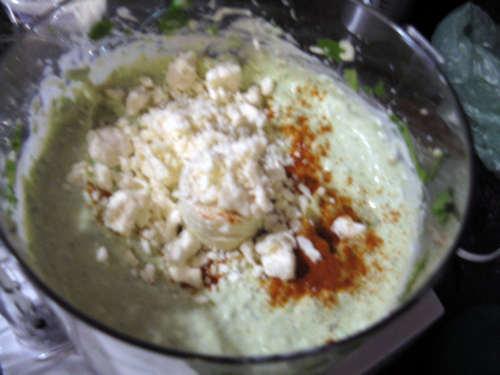 Rip up the last ounce of spinach by hand and mix in for a “chunkier” dip. We’ve already dipped carrots, chips, and crackers into the dip – and I only made it a few hours ago! Both dips are husband-approved (TM). I love the website. The food sounds delecious and I will surely try them. I know the spinach dip is terrific since I tryed that at your house.